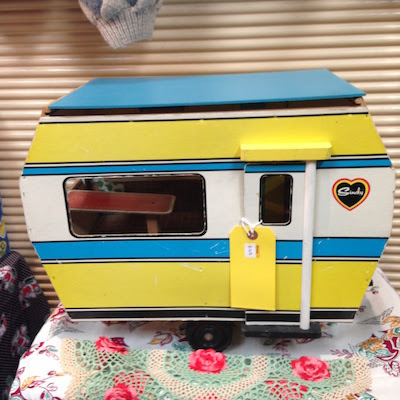 I adored the Sindy caravan on Gem’s Bits n Bobs’ stall. I'd hankered for one in my youth but as we were poor at our house I made do with the inflatable tent and air bed. My Sindy didn't know any better anyway. I always have to pop over to 20th Century Stores to see what Alison and Alex of Snygg have hunted down. I would honestly buy all the fabric they pick out, it's right up my street. 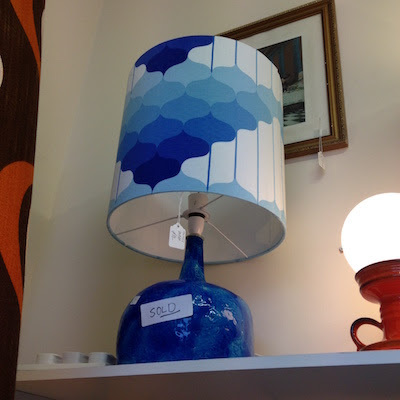 The stunning lamp and shade were already sold but Alison has an amazing range of shades in the best fabrics. Yummy!! Something I would have bought if I'd not already got two! 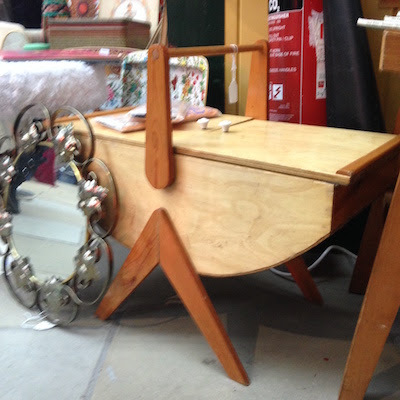 This lovely legged sewing box from Timewarp was a snip at £25.00. 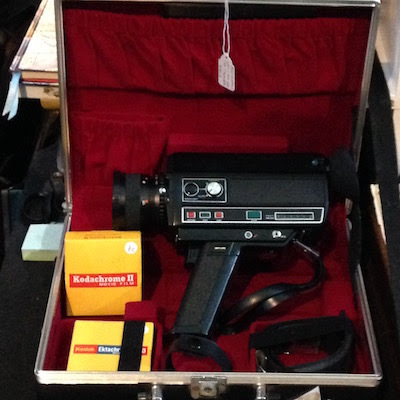 I've a young film maker in the family and thankfully he's not just inspired by the digital era, so this Super 8 camera from We Used To Have One Of Those would make a brilliant stocking filler. Fabric is my favourite addiction. It makes me happy, feeds my eyes and keeps my busy worried head calmer when crafting with it. These examples were from Snygg and Strange Boutique. I've got my fingers crossed that he's back next month and didn't sell them. 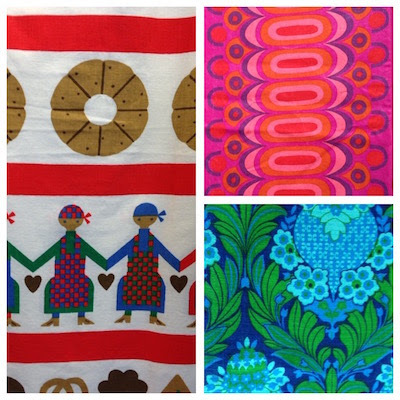 You can follow my addiction to fabric on Instagram @jodijoretro, maybe see what Gilbert is up to @_i_am_gilbert or sneaky peaks of what's in the CRUK Withington vintage section by following @gaynorcowle. 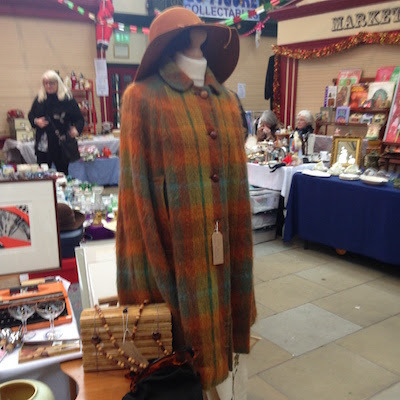 I've been a seller at Vintage Village Stockport for a fair few years as Jodi Jo Retro, mostly my own handmade vintage fabric items, but with full time work commitments it has become a bit too difficult. So for the past year I've been enjoying just coming as a buyer. When the opportunity arose to help out on the CRUK (Cancer Research UK) stall with Gaynor, manager at the Withington branch, I was all for it as I'd get to see all the other sellers and regular visitors that I've got to know. I would like to take this opportunity to thank everyone who kindly bought raffle tickets for a handmade picture I'd done with all proceeds to CRUK, you helped to raise £41.00! Our Sarah (co-founder of Vintage Village) mentioned in passing - or a massive hint, ha ha!! - that there wasn't a Finder of The Fair. I offered my services, thinking how hard can that be?! Well for starters I'm addicted to fabric so I found myself drawn to all the gorgeous fabrics but not everyone wants to see that do they? So I had to a do little refocusing. Anyway, here's my offerings for the No Sleep 'Til Xmas fair. I love tin toys even though I haven't got any, maybe it's something I might start hunting for at future fairs. 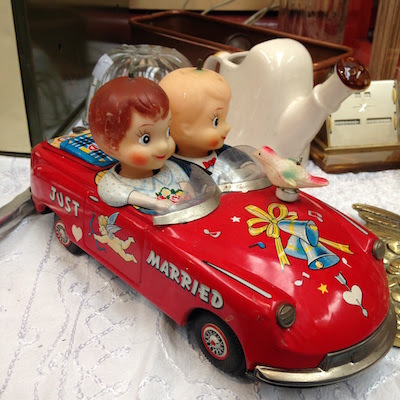 I spotted this adorable tin car on Alice's Top Notch stall. What a splendid wedding present this would be for a collecting couple of newly weds. Alice informed me that once the batteries are in the heads turn to kiss. Alex of Aspidistra takes a right good picture and I haven't done her cape much justice. Beautiful Scottish mohair fabric in scrumptious autumnal shades. 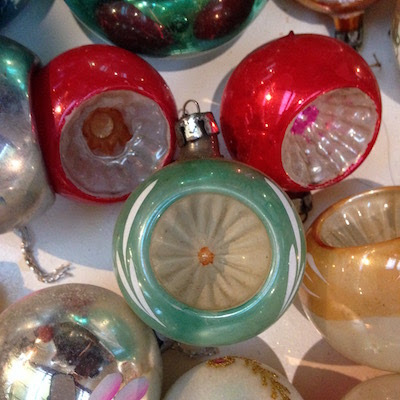 There were lots and lots of Christmas decs and I especially loved these glass baubles from Essentially Eagle at £2.00 each. Gail is very good at hunting requests down but I'll talk about that a little later. Also from Timewarp was Mr Squiz. 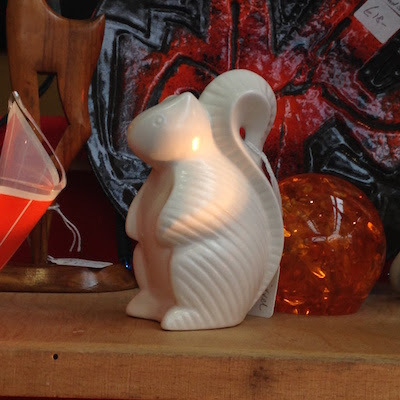 I love a squirrel and in my attempt to take a reasonably good photo I omitted to find out more about him apart from the £10.00 price tag. Now some of you will already know about Malcolm. 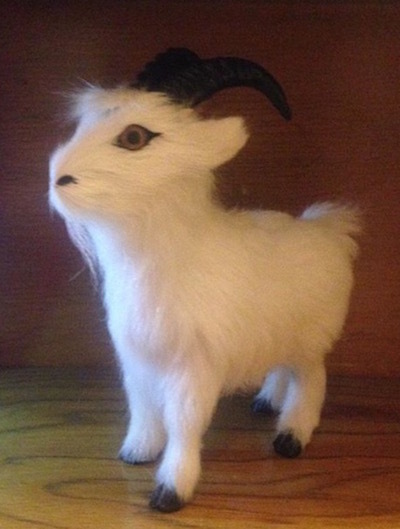 The little goat was the shop mascot at CRUK Withington and was becoming a minor celebrity with his own Instagram account but he was sadly stolen from the nativity display in the shop. The response was amazing and the news of the unfortunate occurrence even made it to the pages of the Manchester Evening News. Gail from Essentially Eagle and Christine from RetroFunky not only helped by sharing the news on social media and contacting newspapers, they also got their hunting heads on. At this fair, Gail presented Gaynor and me with a wrapped box and inside was Gilbert, Malcolm's Uncle. As it's Christmas I'm going to be all sloppy and sentimental. The real Finds of the Fair are the friends you make, sellers and visitors alike.